THIS PROPERTY JUST FELL OUT OF ESCROW ON THE DAY OF CLOSING SO WE ARE 100% READY TO CLOSE WITHIN DAYS!! The Retreat: Sit back and allow Airbnb to make you money effortlessly! Just 15 mins to Centro SMA! 3-bedroom house with 1.5 baths + outdoor shower, office/studio, terraces with panoramic views of the Mountains and Valleys. Two queen beds, one king. Sleeps 6 guests. Reception area with communal kitchen, dining area and media room and library - remodel included in price. Spa area with wet sauna, hot zen tub for 10 people , massage/treatment room, large fire pit, bath and double shower. Ancient botanical gardens with cobblestone and brick walkways connecting the acres of professional landscaping featuring ancient garumbullos, organos, regional succulents and fruit trees. Includes a 400-year old artesian well that nourished travelers along the historic Camino Real that stretched from Veracruz to New Mexico in which Sagrada was a stop for weary travelers centuries ago. 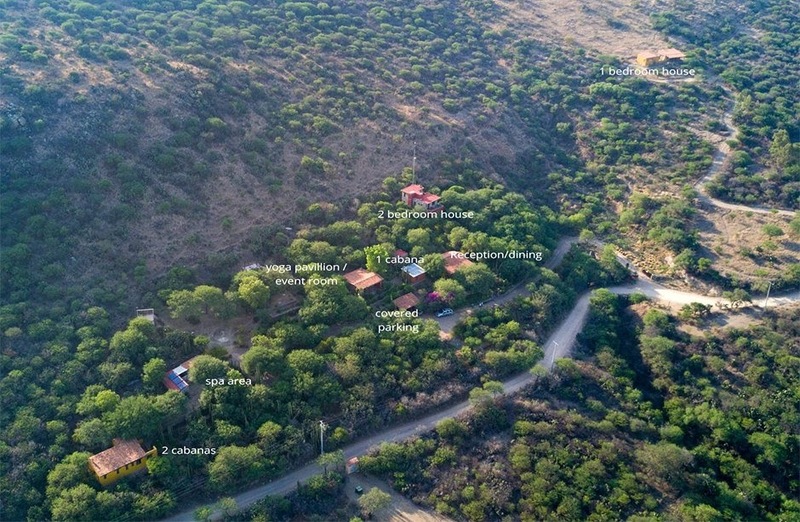 ASKING PRICE: $895,000 USD OR PESOS EQUIVALENT. TURN KEY READY. SEE DETAILS BELOW DOES NOT INCLUDE AN ALLOWANCE FOR 3 TO 4 MORE ACCOMMODATIONS. $999,000 WITH NEW CONSTRUCTION OF 3 OR 4 ADDITIONAL ACCOMMODATIONS. 15 mins to centro San Miguel de Allende! Located on the very historic EL CAMINO REAL VIEJO ANTIGUA. Golden Corridor (RUTA del VINO) 15 minutes to Centro SMA or Antotonilco. Next to famous Agua Termales/Hot Springs and spas. Surrounded by the most beautiful and prestigious Ranches in Mexico. The views at Sagrada are expansive and spectacular in all directions. "Mountain and Valley"
1 working well and new well pump tubing & electrical. Spring-fed water from high on the aquifer. ( Rio Laja ALTA Aquifer)recently purchased 8,000 m2 water and renewing Con Aqua permit and water rights. 1 400 year old ancient historical well. Sagrada provided water and sleeping for the Spaniards while using the road to transport gold, silver and supplies. Recently renovated. Professional architectural Plans and topos. for the future pool - Jacuzi Control room is already equipped ,installed and ready to connect up to the new, future infinity pool. The plans also include landscape and terraces to accommodate weddings and large groups. Dining Lodge and library, industrial kitchen and bath - fully furnished. Books not included. "HISTORICAL BOTANICAL GARDENS AND ORCHARDS"
Logo and Name are registered with Mx. gob. Social Media Facebook & Twitter . Many google listings and guide books inclusions.